Novalis, born Friedrich von Hardenberg, was the most significant representative of German romanticism at the end of the eighteenth century. A true contemporary of the approaching scientific age, he excelled not only as a poet, writer, religious thinker and philosopher, but also as an enthusiastic student of science, mathematics, chemistry, physics, medicine, mineralogy and mining - even working as an inspector of coal pits. However, the full revelation of Novalis' creative genius came as a result of the great tragedy which befell him in his twenty-fifth year: the sudden death of his bride-to-be, Sophie von KÜhn. In March 1797 - having barely reached the age of fifteen - she left the earthly world. While he was visiting Sophie von KÜhn's grave, Novalis experienced a condition of spiritual inspiration which completely changed him and his whole life. The fruits of this inner enlightenment can be found above all in "Hymns to the Night" and "Spiritual Songs". 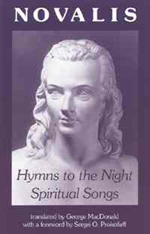 "Hymns to the Nights" gives a poetic description of the poet's inspired awakening, while "Spiritual Songs" expresses the new relationship to the world, humanity and Christianity which thereafter became accessible to his transmuted soul. Both poetic cycles are a consistent development of the central motto which, after the death of his betrothed, Novalis chose for the remainder of his life - a motto which he expressed at the end of his diary in the two words that were most sacred to him: "Christ and Sophia".